Regardless of what you call it, when the soil retains water to any degree you need to think carefully about your choice of plants. Also bear in mind that soils may flood in winter but be bone dry all summer or just moist year round, depending upon the factors which cause water to be retained in the first place. When I found myself in this situation I quickly realized that whereas it was easy to find references to moisture loving perennials and grasses, it was much harder to find information on interesting trees and shrubs so I thought I’d share a few that I have discovered and am trying in various parts of our 5 acre ‘pond’. By the time I’ve finished you may be hunting for marshy spots in your own garden just to have an excuse to grow some of these. Alaskan cedar (Chamaecyparis nootkatensis) - a slow growing conifer to 50’ with foliage which drapes gracefully from the branches. This makes an interesting specimen, especially in the weeping form. Although it does well in wet soil it will not tolerate flooding. 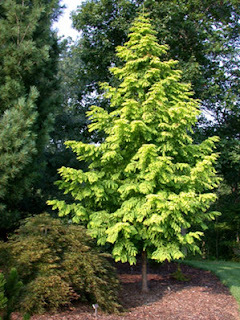 Dawn redwood (Metasequoia glyptostroboides & cultivars) – this deciduous conifer is noted for its strong pyramidal shape, bright green spring foliage and stunning fall color in shades of orange and cinnamon. It does well in extremely wet soil and although the species will grow to 50’ there are several smaller varieties including ‘Gold rush’ which has golden foliage and grows to only about 2/3 the height of the species. Sweetgum (Liquidambar styraciflua) has become a favorite of mine being a tall (eventually 40’) but relatively narrow tree with an upright pyramidal shape. It is slow to leaf out in spring but then shows off its glossy green leaves which turn stunning shades of red, orange and gold in fall. In our previous garden, I allowed the trunk of mine to reach the height of the fence (6’) so that the canopy above effectively screened out our neighbors. In winter the corky bark provides an interesting texture. Sweetgums (Liquidambar sp.) have spectacular fall color. Birches (Betula species) are primarily known for their bark color. The whitebarked Himalayan birch (Betula utilis var. jacquemontii) has the whitest bark of all and a grove of these is spectacular. In smaller spaces try a single multi-trunked specimen to get a similar effect. In certain parts of the country, however, these birches have become infested with the birch borer so the resistant river birch (Betula nigra) is increasingly being used. The bark of these is a soft salmon pink with shreds of peeling bark giving an amazing 3 dimensional texture. I’m planning to plant a group of these in one of the wettest parts of our back garden where it can be enjoyed year round and its silhouette seen to advantage against the winter sky. looks this good but it will be worth the wait. Beautiful. 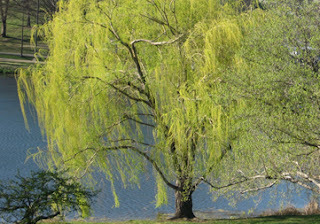 Willows (Salix species). When I realized just how wet our land really was for 5-6 months of the year, with a significant area having standing water I was pretty dismayed as you can imagine. This did not fit with my plans at all! However as with most die-hard gardeners I was determined to plant something and since we have plenty of space I bought the ‘Niobe’ weeping willow (Salix alba ‘Trista’) which has bright yellow branches to provide interest even in winter and have it planted where it marks the entrance to a wet meadow. It was planted bare root last year into saturated soil (the hole kept filling with water as I dug!) and has been underwater since December yet it has leafed out beautifully and has grown about 12” in height since last year so I have to say it’s a trouper. 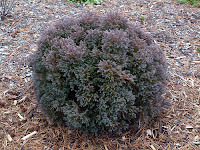 I was excited to discover that the white cedars (Chamaecyparis thyoides cultivars) tolerate winter wet and heavy clay soil as I am particularly fond of the variety ‘Heather bun’ which maintains a tidy dome shape. The green threadlike foliage takes on a burgundy cast during winter adding an additional layer of interest. Also look for the varieties ‘Red Star’ with its tight upright shape – great for containers and ‘Northern skies’; a dwarf, feathery mound. Glossy evergreen leaves and fragrant spring flowers are the hallmarks of the Mexican orange blossom (Choiysa ternata). 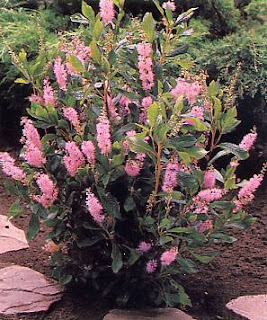 This easy to grow shrub reaches 6' or so and does well in waterlogged clay soil. There are lots of deciduous shrubs to choose from and many could arguably be called small trees. Serviceberries (Amelanchier sp.) are perhaps the best known of these with their white spring flowers and red berries beloved by the birds. 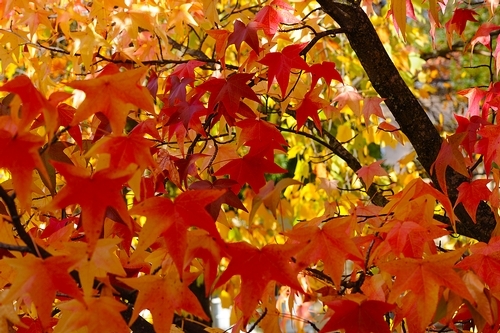 They vary in height from 8-20’ depending upon the variety and give stunning fall color, especially ‘Autumn brilliance’. Avoid planting these near the front door, however, or you'll get squished berries tracked through your home! 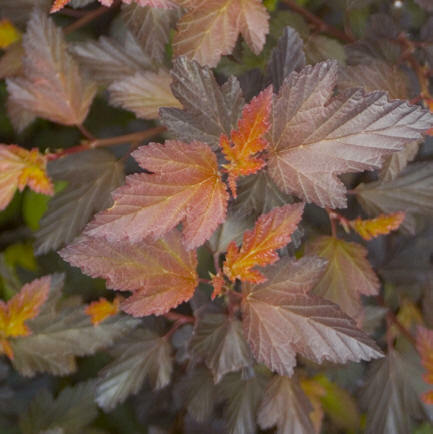 The foliage of 'Coppertina' ninebark glows when backlit. I fell in love with the ninebarks (Physocarpus opufolius) when ‘Diablo’ first appeared in the nurseries with its rich mahogany leaves. Now the selections include ‘Coppertina’ (my current favorite), ‘Darts gold’, ‘Center glow’ and ‘Nugget’. They are really tough, coping just fine with drought or drowning, sun or shade. You can prune them or leave them as the mood and need strikes. Sadly the deer also like them but I’m ready to battle with them just to enjoy these shrubs in my soggy spots. Spring flowers are followed by seed heads which the birds enjoy, while the vibrant fall color and ridged bark add new elements for the colder months. What’s not to love? Just when most shrubs are done for the season summersweet (Clethra sp.) blooms with fluffy pink or white racemes, smelling of vanilla and honey. They like part shade but also cope with reasonable sun. Look out for ‘Ruby spice’ with its rose pink flowers which grows to 6-8’ tall and 4-5’ wide, or ‘Sixteen candles’, which unlike its parent ‘Hummingbird’ does not sucker but rather stays nicely where it is put! The white flower spikes on this variety stand upright on the branches, hence its name. It's a little smaller too at 5’ x 5’. Put these late season stars shrubs near an area where you can enjoy the summer perfume. Summersweet is another of those useful transitional shrubs which work beautifully bridging the more ornamental garden and wilder areas beyond. Shrub dogwoods (Cornus sp.) are perhaps one of the most adaptable plants. They cope with hard clay with its inevitable standing water in winter yet don’t complain when the soil then turns to concrete in summer. Plain or variegated leaves in white or gold, stems in red or yellow and summer flowers all make these a mainstay of the garden. Some species are prone to ‘running’ (stolonifera species syn. sericea) but others are better behaved (sanguinea species which includes the variety ‘Midwinter fire’). Choose carefully. Curly willow shrubs - but they do sucker. Great for floral arrangements. Hydrangeas – most tolerate winter wet but not summer drought. Perform best with afternoon shade. Elderberries (Sambucus cvs.) are arching shrubs which grow 12-15’ depending upon the variety. I have the native variety in our garden and it is both in the wrong place and proving difficult to get rid of! I believe the newer cultivars are much better behaved. Look for 'Sutherland Gold', 'Black beauty' and 'Black lace'. Viburnum sp – there are many deciduous varieties of this shrub, many of which tolerate wet soil but not standing water. The cranberry viburnum (V. trilobum) is one of my favorites with clusters of glossy red berries and vivid red fall color. 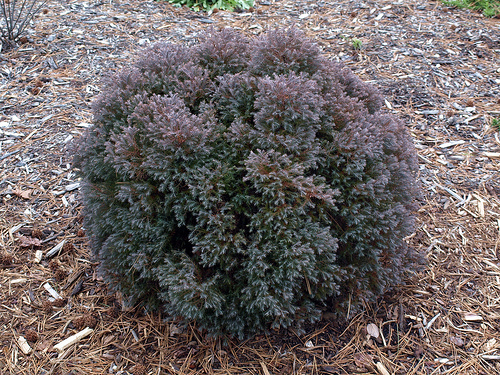 A mass of these in front of solid evergreens would make a striking fall vignette. Swedish aspen (Populus tremula 'erecta'). An alternative to the disease and insect prone quaking aspen. Chokeberry (Aronia sp.) - black or red berries and unbelievable scarlet fall color. A shrub for the more naturalistic areas of the garden. Right Plant, Right Place by Nicola Ferguson, Fireside 2005. This is a wonderful reference book which covers everything from plants which have winter interest to those which thrive in wet soil.